The body produces around 1.5 litres of saliva every day and it plays a vital role in lubricating food, digestion and protecting the oral environment. This article shall consider the production of saliva, how it varies on consumption of food and the consequences of low secretion. 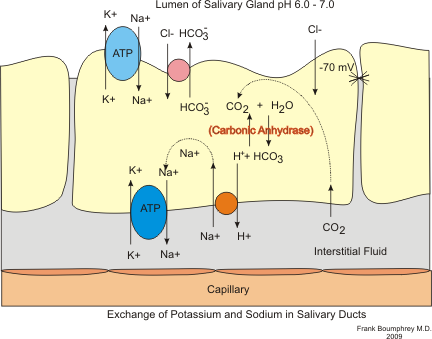 Saliva has many important roles within the gastrointestinal system. Not only does it help to lubricate and wet food but it also begins the digestion of carbohydrates. There are three paired salivary glands that are responsible for the production of saliva, the submandibular glands, the sublingual glands and the parotid glands. They are all ducted, exocrine glands. Each of the glands produces a slightly different secretion. The parotid glands produce serous saliva: a watery secretion that is rich in enzymes. The secretion from the sub-lingual glands is known as mucous saliva; a viscous secretion containing no enzymes and large amounts of mucus. Finally the sub-mandibular glands produce a mixed secretion, that is both serous and mucous. Further information on the anatomy of these glands can be found here. Saliva is always a hypotonic solution but it needs to be produced from concentrated extra-cellular fluid and modified. The ductal cells have a maximum rate of modification and therefore the more rapidly saliva is produced, the less it is modified (excluding bicarbonate). Fig 1 – Diagram showing the modification of saliva. Xerostomia is the feeling of a dry mouth and it occurs when there is either a change in the composition of saliva or reduced salivary flow. Generally the treatment is often unsatisfactory. If there is an identifiable cause then it should be dealt with first, but often the xerostomia cannot be corrected in spite of this. Saliva substitutes are available, as well as stimulants designed to encourage the salivary glands to increase production – although these stimulants are generally ineffective unless there is still salivary function. In addition, education plays an important role in terms of improving dental hygiene. Fig 2 – Image showing the mouth of a patient suffering from xerostomia. Which of the following is not a function of saliva? Which of the following is not a salivary gland? What happens to the pH of saliva when the rate of production increases? Which of the following is not a cause of xerostomia?